After the pilot had boarded his particular vessel the coble was taken in tow stern first, an unusual procedure but the reason is apparent when the peculiar lines of a coble are analysed. A coble has a very big foreward sheer with a consequent considerable depth of forefoot. 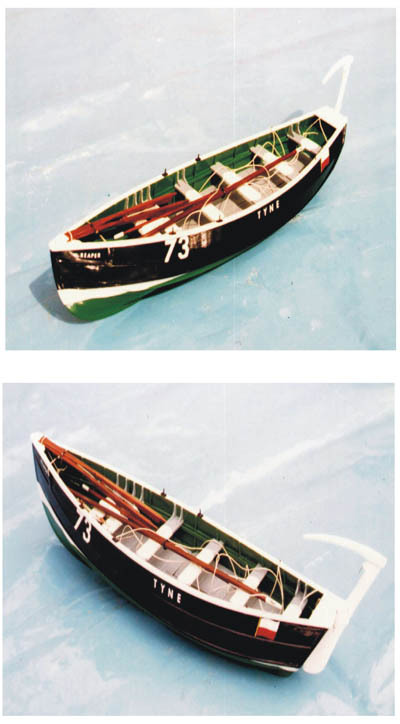 At the same time, the lines or form of the bow and forepart of the boat are extremely fine, in comparison with the shallowed and more rounded form of the after part, so that when towed stern first the knife like bow sinks further into the water acts as a rudder or fin, and keeps the coble on a seaworthy course by its grip on the water. They were about 26 feet in length and about the middle of the nineteenth century cost about £30. Each boat had its official number painted on the bow and its name on the stern. A cruising range of thirty miles was quite common. At best they were regarded by outsiders as a difficult boat which required delicate handling in rough weather. All in all they were a craft which it was essential to grow up with. Needless to say, they were managed in this case with great skill. 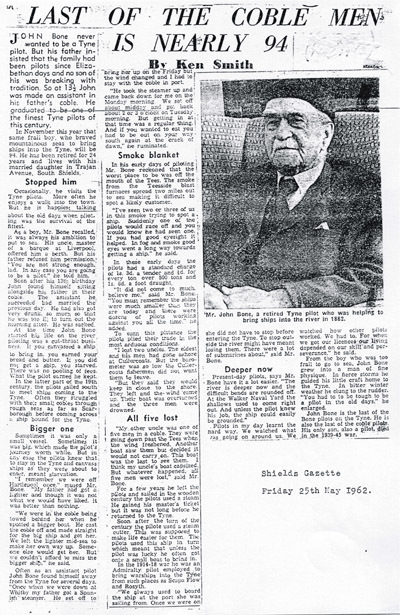 As stated it was not uncommon to find Tyne Pilot cobles as far south as Whitby , and the following account from Mr. John Bone in 1961 ‘a retired Tyne pilot aged 93’ is of such a trip taken in 1883, when he was fifteen years old. ‘My father woke me just after midnight and by 1.0 a.m. we were moving down river towards the bar. We intended to ‘seek’ south as the ‘North chance’ had been no good for the last week or two. The weather was good and before long we fell in with another boat, a Cullercoats fisherman but also a licenced pilot. (12 Cullercoats fishermen had been licensed by Trinity House in 1865 in retaliation for the so called insubordination of the Tyne Pilots.) The fish must not have been biting so he’d decided to look out for a ship. There were four in the boat, probably his sons. We were about half a mile apart and both keen to keep in front of the other. After three or four hours a full rigged French ship came in sight but because of our distance apart, the Cullercoats’ man got her. We decided to, or rather my father did, to sail on south. Then the wind shifted from South West to North West so we made for the shore. We landed at Rosedale about 9 miles north of Whitby . There was a lighter bound for the Tyne and they offered to tow us back. Mr. John Bone comes from a very old pilot family. In fact he maintains that as long as there have been pilots on the Tyne , there has been a John Bone doing the job, and St. Hilda’s churchyard still boasts one tombstone dedicated to the memory of a John Bone, pilot who died in the year 1706. The Bone family provide a perfect example of the typical Tyne pilots who lived, moved and married amongst their own class. His mother was a pilot’s daughter, his grandmother, his great grandmother and his great, great grandmother. No doubt, further research would only provide further examples of inter marriage. 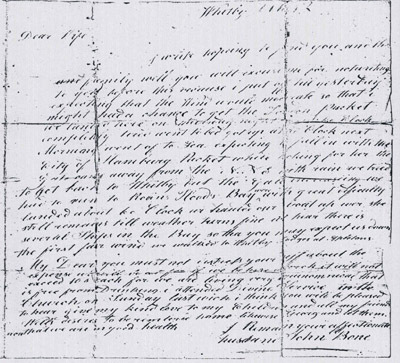 Amongst the family heirlooms is a most interesting letter written by his grand father in 1842. After sailing abroad ‘seeking’ as far as Whitby bad weather had driven them into the shelter of Robin Hoods Bay, where they had been held three days. In order to allay family worries, he wrote the letter and sent it by coach, folding the letter in the fashion of the day to serve as an envelope. From it we can imagine some of the worries and fears of a pilots wife, and one is left with an impression that, money when obtained, was not to be squandered. I write hoping to find you and the family well. You will excuse me for not writing to you before this because I put off till yesterday expecting that the wind would moderate so that I might have a chance to get the London Packet. We landed here on Thursday at 6.0 clock completely tired went to bed got up at 3.0 clock next morning went to sea expecting to fall in with the City of Hamburg Packet while waiting for her the gale came away from the N.N.E. with rain we tried to get back to Whitby but the Gale increasing we had to run to Robin Hoods Bay were with great difficulty landed about 6.0 clock we hauled our boat up were she still remains till weather turns fine we hear there is several ships in the Bay so that you may expect us down the first fair wind we walked to Whitby Rodges at Apletons task management system. A Shields coble with five pilots onboard, left Cullercoats trying to make Shields Harbour . However, the coble was overturned and all five were drowned, their cries for help could be heard by the sentries on Spanish Battery, but no assistance could be given. On Thursday afternoon last week three pilots; John Harrison, Ralph Harrison and Thomas Tindle had a narrow escape from drowning, while they were lying within the Bar. A high sea came in and overwhelmed their coble, turning it bottom up and throwing the pilots into the water. One of them, Thomas Tindle was under the boat some minutes and the other men were almost exhausted when some other pilots came to their assistance. About 4.30pm Wednesday afternoon, as Thomas and John Chambers (pilots) belonging to South Shields were returning from sea in their coble, and when near the Bar a heavy sea struck the boat and capsized it, precipitating both men into the water. The accident was fortunately observed by a number of pilots from the Lawe, who immediately launched the lifeboat and proceeded to the assistance of the two Chambers. Before however they arrived at the place, John Chambers had become exhausted and sank, Thomas Chambers who was clinging by the boats’ yard, was rescued. John Chambers who had met his death under such distressing circumstances had but recently been married and was only 22 years of age. We regret to have to announce the painful fact of the loss of two South Shields pilots and their apprentice by the upsetting of their coble at sea. About midnight on Wednesday George Tinmouth senior, and James Purvis, pilots together with George Tinmouth junior, a young man of nineteen years of age, son of George Tinmouth senior, an apprentice, left Shields Harbour in search of vessels. About noon yesterday the coble was seen at sea off the Trow Rocks, bottom upwards, by the steam tug ‘Engineer’. The steamer at once proceeded towards it, but in endeavouring to right it, the rope broke and the coble sank. It is supposed that during the night, which was stormy, the wind blowing fresh from the s.s.w., the coble had been caught in a squall and upset, those onboard being precipitated into the sea and drowned. The bodies of the unfortunate men have not been recovered. Three pilots; John Heron, John Houlsby and Lancelot Burn, (who were lifeboatmen themselves) were rescued by the lifeboat ‘Tyne’ when their coble was swamped off the Herd Sands in heavy seas. The s.s. ‘Alice’ entering the Tyne , struck the pilot coble, cutting it in half and throwing the three pilots into the sea. One of them, James Stewart, was drowned. Thomas Young, John Ramsey and Thomas Tindle (assistant) lost their lives alongside the South Pier when their coble foundered in Northerly gale. Three pilots; John Landers Burn, Arthur Landers Burn, William Clarke Stephenson and apprentice John Bone, in danger of being swamped in a gale, were picked up from their coble ‘Argo’ by a passing schooner and taken to Bridlington. Respecting the drowning of two South Shields pilots; Thomas Stephenson and David Young, off the Tyne on Monday morning, information has been received from Marsden stating that some wreckage has come ashore on the beach at that place, belonging to a pilots’ coble. A portion of the wreckage bears the number of the coble, it is stated that an oar has been washed up at Souter Point. 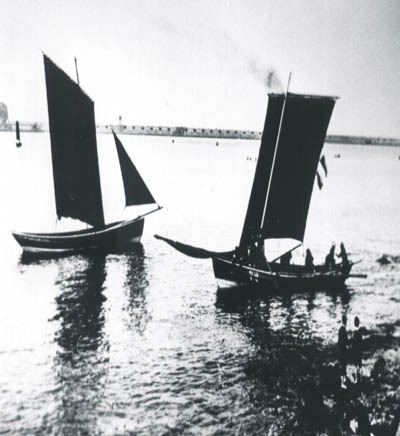 The pilot coble ‘Victory’ was lost at sea whilst James Carter and Philip Young were returning home. The wind was SSE, a sea struck the boat about 300 yards outside the harbour and it sank. The tug ‘Rainbow’ picked up James Carter but Philip Young was lost. A distressing accident occurred at sea off Marsden Rocks on Sunday by which Joseph Chambers (pilot) belonging to South Shields was drowned. Joseph Chambers and another pilot, Thomas Tinmouth were in their coble off Marsden waiting for vessels requiring their assistance, when a sea struck the boat and upset it, both men being precipitated into the sea. Thomas Tinmouth got hold of one of the oars of the coble, and so succeeded in reaching the shore; Joseph Chambers after struggling for some time sank, his body has since been recovered and brought home.